The early years of a child’s life are crucial in terms of emotional, physical, social and intellectual development as well as the development of creativity and imagination. Much of the learning that takes place does so between birth and the age of six. Education begins in the home and continues in a range of settings. Parents/carers are a child’s first and best teachers and at Joseph Locke Primary School we look forward to working in partnership with parents/carers and other appropriate outside agencies to ensure a child’s success and happiness in school. The period from birth to the age of five is described as the Early Years Foundation Stage in education. It is a distinct stage and important both in its own right and in preparing children for later schooling since it is here that they discover and are taught a great many things about life. They learn about confidence, independence, self-esteem and self-sufficiency as well as about relationships with adults and other children outside the home. The Foundation Stage Staff at Joseph Locke Primary School aim to provide a safe, happy and stimulating environment, rich in language, in which parents/carers and children feel secure about the learning that takes place. Early Years provision supports and extends knowledge, understanding, skills and confidence, helping children to overcome any disadvantage by building on what they already know and can do. We encourage positive attitudes to education, persistence and a disposition to learning whilst at the same time protecting children from early failure. The early year’s curriculum is carefully structured so that children are provided with opportunities to explore, experiment, plan and make decisions which enable them to learn, develop and progress. A balance between planned activities and those initiated by children is ensured. Using ‘Bold Beginnings’ as a starting point, the staff use a cycle of planning and reviewing provision to ensure that activities are well matched to children’s ever-changing needs and interests. A vibrant environment, indoors and out, and quality ‘first - hand experience’ to include caring for pet fish, a visit from a dinosaur, a picnic on the moon following a trip to the local supermarket in addition to a very exciting trip to the moon for a ‘real’ picnic, supports children’s learning and progress very effectively. 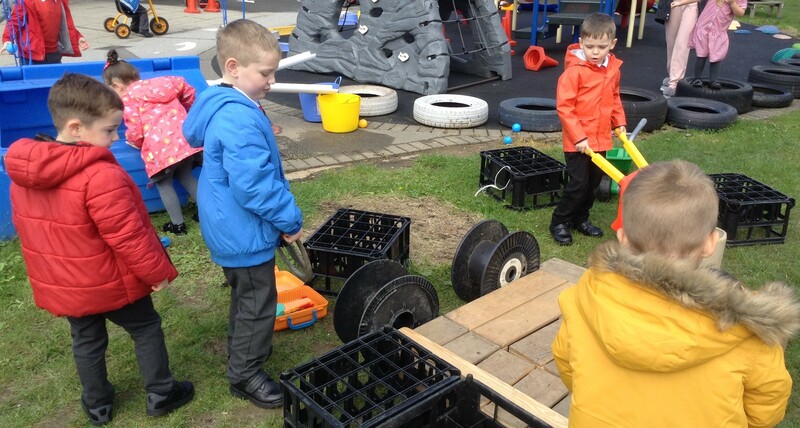 The range and quality of continuous provision both indoors and out, to model quality interaction and intervention to impact upon both children’s confidence and achievement. This is exemplified by writing produced in the ‘super hero writing dens’ in response to Lizard Wizard stealing Ratty from his basket ‘begging’ the lizard to safely return their friend or the community police officers visit when she came to arrest evil pea!